Home > Complementary Treatments > The Use of Magnets as a Therapy for Back Pain. Suffering from long term back pain can mean years of taking a cocktail of medications and spending many hours waiting in clinics trying in vain to find something that will help ease the pain. Taking medications for long periods may cause them to lessen in effect which means a higher dose has be taken with the added possibility of suffering from side effects as well. Because of this more and more people are looking for other ways of decreasing discomfort and pain and are turning to complimentary and alternative therapies for some relief. Magnetic therapy is a term given by magnet manufacturers that suggest by exposing the body to magneto static fields, healing of injured tissues can take place. Practitioners of the therapy believe that by placing a magnet near to an affected site, the blood flow is increased which aids healing. The magnets are most commonly seen in belts, bracelets and wrist and ankle straps. 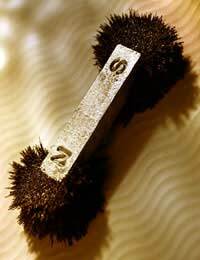 Magnets can be used as a therapy for many disorders as the public can buy them independently and use them as they choose. Retailers of the magnets suggest that they can be used for both long and short term pain, damaged tissues and bones and even in the treatment of cancer. The scientific evidence produced so far has produced no substantial evidence that the use of magnets has any benefits to health at all. Several clinical trials that have tested the use of magnets against a placebo showed that those randomised with the magnets had no more positive effects than those with the placebo. Doctors cannot really recommend the use of magnets as an approved therapy until more positive results are shown but as there doesn’t appear to be any negative effects of using magnet therapy they may still be worn safely. Isn’t It All Just A Scam? There are many companies out there trying to make easy money and will try and sell you second rate products that offer no relief but there are some genuine ones who also want to make their business a success but want that business to be ethical. If you are concerned about purchasing any magnets for your pain relief it may be worth researching the existing companies and finding one that will allow you to return the goods after 3 weeks or so if you feel they are not working for you. If the company does not offer this facility try another one until you are happy with the terms. If you can afford to buy the magnets then go ahead and try them but if you are going to compromise your financial budget by purchasing this therapy, remember that the results have shown no beneficial effects on health so far. Magnets have been used as a therapy for health conditions for hundreds of years but research fails to demonstrate any positive effects on health and any scientific evidence that supports the notion.